In this picture, Triggertrap’s Head of Photography @Thomas_Langley is shouting at Frank Doorhof, during Photokina in Cologne last year. It looks like they could both do with a little holiday, to be honest. Written by Triggertrap’s Managing Director, @MatRodger. It is an update to @Haje’s article about how our holiday policy initially backfired. Like most people I know, I spent a good portion of my twenties working for relatively crappy money. I say “relatively” because, of course, for lots of people around the world, what I earned was very nice money indeed. But I lived and worked in central London, paid way too much rent, went to the pub too often, and occasionally had to buy non-essentials like food and clothing. As a result, I never had much money left over at the end of the month to put aside for extravagant things like foreign holidays. They happened from time-to-time, but were almost always lightning-fast city breaks to European capitals on budget airlines for no more than two nights in a row. I don’t want Triggertrap’s young staff to have to go through that pointless, sad cycle every year. The upshot of this was that I always ended up with tons of holiday left at the end of the year. Why book more than the odd day off at a time when you’ve got no money to go anywhere? Cue whole lonely weeks in December or March, sat around playing Xbox while all my friends were at work, just because I “had” to use up all my holiday. Well, I’m in charge of a company now, and I don’t want Triggertrap’s young staff to have to go through that pointless, sad cycle every year. I get to set the policy — and as far as I can see a good holiday policy should lead to happy, well-rested, and well-travelled workers (while keeping the company functional, of course). What it shouldn’t lead to is skint 20-somethings taking days off they don’t want, twiddling their thumbs until it’s time to come to work again. I also have a baby daughter now, and I want to be able to take as much time off to hang out with her and her mother as I can (you would too, they’re ace). I don’t want to worry about the odd family day here or there eating into any strictly rationed quota. Therefore, since January of this year, Triggertrap have been using a “take-as-many-days-as-you-want-and-get-a-cash-bonus-every-time-you-take-ten-days-in-six-months” system. There’s probably a catchier name for it out there, but our founder Haje laid out all the details here a little while back. Essentially, after experimenting with a “take-as-many-days-as-you-like” system in 2014 when no one took nearly as many days as they should have done, we decided to incentivise getting away from the office and chilling out for a bit. Taking 10 days holiday in the first six months of the year triggered a £300 bonus. Guess how many people took nine days? Taking ten days in the first half of the year got each staff member £300 in their payslip, paid in the month of the holiday that triggered the bonus. Not a huge amount of money, but it’s a bit of vacation spending cash and — crucially, I think — an incentive to actually do something with your time off. It’s also a figure a small company like ours can afford and budget for. Obviously, given that there’s a bonus involved, every single team member took the minimum ten days between January and July and collected their money. Why wouldn’t you, right? So, it’s clearly an improvement on 2014, but the system has still got a way to go to prove itself. It follows that those team members who took only 10 days in Q1 and Q2 are still only on course to have taken 20 days by December — well below the statutory UK entitlement of 28 days — so we still need to work out a way of encouraging busy people to take the right amount of rest at the busiest time of year. 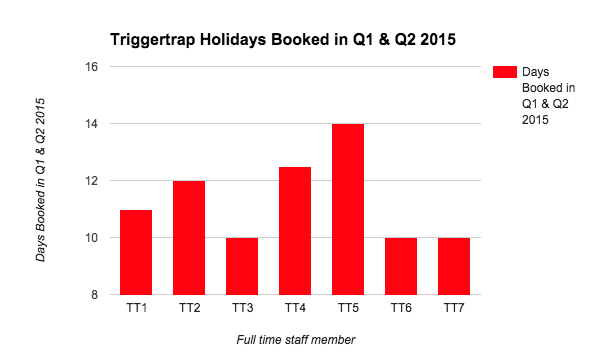 Taking holiday in Q4 can be incredibly difficult to justify to yourself and your managers, especially in a ridiculously busy startup like Triggertrap, and particularly when you don’t have an official “holiday entitlement remaining” number to wave in your boss’s face. We’re hoping that by continuing to monitor (rather than restrict) paid time off, along with the general health and wellbeing of the team (through, among other genius management techniques, talking to them and buying them lots of beer every Friday) we’ll avoid a bare minimum situation and have a happy team going into the new year. Want to stay in the loop on how we’re growing and building the company? Give @Triggertrap a follow on Twitter, and don’t forgot to keep an eye on the Triggertrap Playbook publication here on Medium.